Pasta is an Italian food made from a dough using flour, water and/or eggs. Pasta was and is the most commonly used food in many of the American homes. Why Americans, even Asians love pasta. Pasta is one of the simplest yet scrumptious food given to the world by Italians. There are nearly 350 different shapes of pasta and you can prepare them in any way you want. To know more about different pasta shapes visit Pasta and its shapes. Pasta is a delicious food by itself, and just by adding few more ingredients increases the richness of this food. To get the answers for many pasta related questions like, how to store pasta?, how to cook pasta perfectly? etc. visit the National Pasta Association. Now for the Pasta made in an Indian way. Yesterday, I was lazy to prepare dinner. I wanted to complete my dinner preparation within 15mts. With any other food, it would have taken minimum of 30mts. So I decided Pasta is my best choice. But, I did not have any sauce or any other vegetable in my fridge to go with my pasta. My favourite Onions and tomatoes came to my rescue. 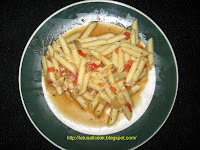 This Pasta with tomato and onions is the most simplest way of preparing this food. Cook the pasta as directed by the manufacturer. In a pan, add oil, mustard seeds, cumin seeds. When the seeds pops, add onion and saute them. When the onion turns light brown add the tomatoes, garlic and fry for 2 min. Add the cumin powder,coriander powder, chilli powder, salt and mix well. Add 1 cup of water and cook this mixture in a Sim flame for 10 minutes. Finally add pepper powder and mix. If the mixture becomes dry add some water to it and cook. Now in a bowl, mix the cooked pasta and this tomato mixture. Serve hot. This is mostly like Tomato rice recipe. Instead of Rice we add Pasta. How much more can you ask from food? So easy huh? What a coincidence? I made an indianized pasta from yet another blog for dinner tonight. This one also sounds delicious. I will give it a try sometime soon. That's sounds different and esy..will give it a try .. I love Indian style pasta....I add lots of coriander-cumin powder for a lovely flavor...you've got me craving some now. Pasta is one of my favourite dishes!! Thanks all...its nice to know that pasta is ruling our tummy! :).. that was delish.. your indianised pasta....will give it a try!